Grow 15 tons and what do you get? Another day older and deeper in poo. I can't count the number of times I have heard someone say, "You can't grow anything but cheat grass in Central Oregon." It is certainly true that in the high desert, we do not have the luxury of just throwing seeds on the ground and watching a jungle emerge. At Seed to Table, we sweat, dig, water, pray, wish and hope our seedlings will emerge and maybe grow up to our shins. And grow they do. This year, we will grow 15 tons of veggies on one acre of land - to the amazement of many onlookers. The secret to our success has been in understanding and building our soil. First, it was important for us to understand the soil situation in Central Oregon. The Natural Resource Conservation Service (NRCS) has identified over 20,000 different soil classifications, based on climate, topography and historic use, in the United States. We quickly learned that not all soils are created equal. Oregon's state soil type (yes, Oregon has a state soil) is called Jory, which is a deep, highly productive soil, rich in organic matter and is found exclusively west of the Cascades. Jory is what makes the Willamette Valley one of the top agricultural producers in the entire United States. High-desert soil, on the other hand, is sandy, coarse, high in volcanic rock and - generally - void of organic matter. What are the natural functions to feed our soil biology in Central Oregon? Think sagebrush leaves, juniper berries, cheat grass and ponderosa needles. When Seed to Table first had its soil tested in 2013, we learned that our soil had 1.7 percent organic matter compared to our desired minimum of 7 percent. Since organic practices are essential to our education farm, chemical fertilizers are not an option for us. 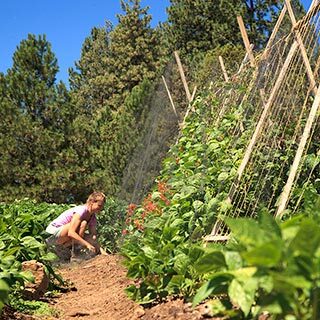 To create a successful veggie farm in Central Oregon, we would have to make our soil more like Jory - a highly productive, living, breathing ecosystem. Our focus has been on increasing the amount of organic matter - plant and animal residue - in our soil to promote high levels of biologic activity. In our desired soil ecosystem, each handful of soil can have 50 billion bacteria cells, half a million fungal cells, algae, protozoa and tiny critters too numerous to count. Central Oregon soils may only foster half of this amount of biologic activity. The more biologic activity in the soil, the more nutrients that are available to plants. Since starting the farm four years ago, we've added up to 20 dump-truck loads of composted horse and cattle manure, along with bone meal, blood meal and fish emulsion, each year to make our soil rich enough that it can mimic natural ecosystems of decay and renewal. When we re-tested our soil this year, our organic matter was up to 5.5 percent! While we continue work to achieve our 7 percent goal, our crops this year are larger and stronger than ever. The best part? More productive soil means our workload has decreased. For instance, we only had to apply half as much compost to our beds as we did in prior years. And we can continue building our organic matter by simply tilling our crops back into the soil at season's end - replicating the natural system of leaf fall and decomposition. Soil is a delicate ecosystem requiring our care and long-term vision. We need only to look to the Dust Bowl for an example of the dire consequences of poor farming practices. I am pleased to know that many farmers are realizing the benefits of increasing organic matter. You, too, can reap substantial benefits from increasing organic matter and cutting back and, eventually, eliminating chemical fertilizers. Here's how - add at least two inches of high-quality compost or composted manure to your garden EACH YEAR. For the first year or two, add up to four inches of compost. Turn the organic matter into the soil. Feeding your soil to promote high biologic activity can also help balance those nasty pests we all see; decreasing the need for harmful pesticides. 10 a.m. to noon. Register at www.seedtotableoregon.org.